Deceptively easy crochet dishcloths build on basic skills for an impressive, textured design. Ideal for intermediate crocheters, these amply sized and practical dishcloths are crafted from patterns using half double crochet stitches on a foundation mesh. With color charts and written instructions, the six projects are easy to follow, and the creative designs make fantastic gifts for any occasion. 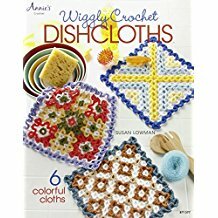 The projects call for lightweight cotton yarn that is great for scrubbing dishes and can be easily washed afterward.